That's pretty close... less the theatrics. yeah thats why i chose it. 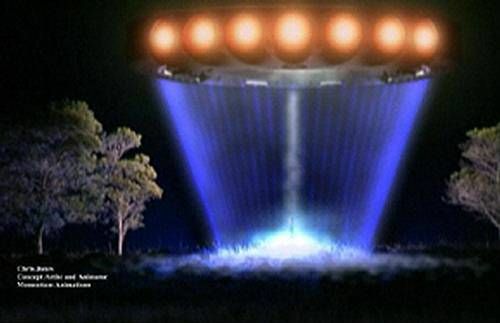 i just googled 'different kinds of ufo's' and images came up. that was one of em. (10-06-2015, 11:25 PM)Cynicalabsurdance Wrote: something like this ? Like a fluorescent tube filled with orange glowing balls. What we saw could "pop in" & "pop out" of the sky, then appear elsewhere pretty much instantly. The air force, or at least i assume it was the air force were flying in silent mode as if searching for something, so whatever it was they (whoever they were) picked it up on radar. We saw no actual craft structure per se, what I Pohotoshopped was very close what we saw, with the exception of the amount of lights. I didn't have time to count them as it was visible for 2 seconds, then appeared elsewhere, quite far away instantaneously, as soon as the lights flipped off. Octo saw it 3 places at once, which, from what I understand, is classic anti-gravity EM torsion based propulsion characteristics. Those who witnessed Die Glocke in flight reportedly witnessed the same thing. Thus explaining cattle abductions for leather seats. It all makes sense now! Cattle mutilations have been a subject we have not been able to talk about until quite recently, as to do so would have involved actively engaging those in the Service-to-Self, a task we do not at present have the resources for as we are engaged in higher priority tasks. This was a Service-to-Self scam we anticipated would fail, as fail it has. Humans were only mildly discomfited by mutilations, and understood they were unlikely to become targets. Where the alien visitors in the Service-to-Self who were perpetrating the mutilations have walked away from this activity, it will still continue for some time due to the interest of their human counterparts. This was a joint alien-human activity, though the motives of the participants differed. The message was also disseminated that mutilations were done while the animal was alive, tortured not only by the pain but by the knowledge of what was being mutilated. Human contactees who gave The Call to the Service-to-Self were at times given such a show, and returned with this story to tell. However, in spite of years and even decades of mutilations, the impact has been scarcely more than a curiosity. Humans did not take the implied threat to themselves seriously, as it was clear that if they could be a target then human mutilations would be occurring. The pattern was not one where humans entered into the mutilation cycle, in spite of rumors that one or two humans might have been so mutilated. The fact that thousands of animals were mutilated stood out as a disproportionate pattern. The humans involved are part of what is loosely called the New World Order, and it is they who harass contactees and UFOlogists with their black helicopters, not any arm of the government. These individuals were interested in keeping human society at arms length from aliens, in keeping with the scare tactics used in the movie ID4. Their motives were to keep human society moving in its present tracks, under the control of the present establishment. Human participants were alerted prior to planned mutilations by being the planners. It was they who selected and marked the cattle, and having thus tagged the target they were in a position to be alerted when the mutilation began. No actual communication flowed between the humans involved and the aliens, as mutilations at first began as a human activity and to the surprise of the human perpetrators, aliens began doing the mutilations before they could arrive on the scene. Not ones to turn down a favor, especially as they were trying to foist the impression on human society that aliens could not be trusted, they just went along. Hahahaha... nope. We were straight as arrows. You guys have all the luck! Did any other villagers see it? Dammit, bring on the Bluebeam Show already! I want to see the aliens! They aren't waiting for disclosure. Big fish are coming in already and father is not far behind. They are showing themselves. Gone are they days of blurry what's that on that image? There is a war going on in the backdrop.. The masses are beginning to be privileged to see what the num they are. And why not.? They are coming out of obscurity to the forefront. We are more than conditioned already to except an awe inspiring good sighting. No more mass rioting as in the radio play of war of the worlds. It's what we want that matters and we are tired of waiting. We want truth.. Don't you more than ever want the truth?